Maintain the mechanical operations, bodies, interiors and classic artistic styling of vintage, exotic, and special interest automobiles. Restore or preserve the automobile per the owners request. Reuse and rebuild original parts when appropriate or replace with contemporary parts depending on the client’s wishes. Exceed clients’ expectations in level of service, quality, communication and transparency each time they allow us the privilege of working on their automobile. 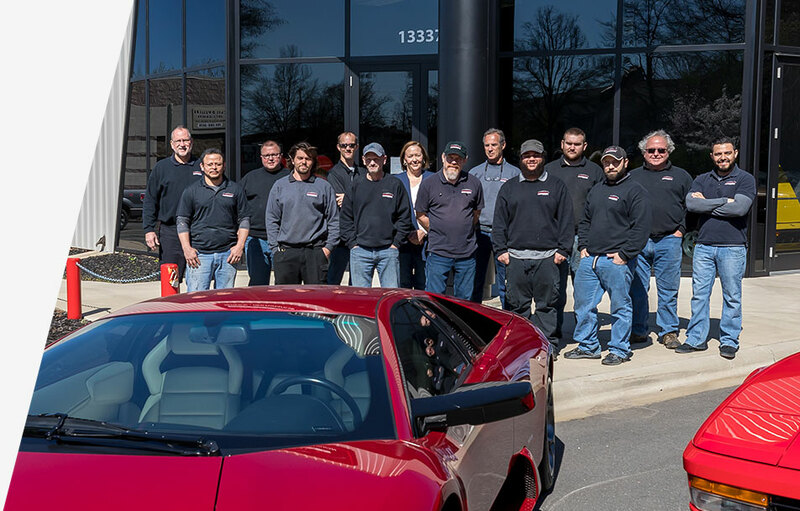 After successfully servicing the Rolls Royce and specialty car community at Jenkins & Jenkins in Charlotte NC for 14+ years, Jarod Brown and Jean Robitaille decided in 2000 to open their own business to serve this unique market niche. In 2001 Automotive International officially opened. The primary focus was on Rolls Royce, Bentley, Ferraris and Aston Martins. Scope of services included basic mechanical maintenance to complete body off restorations and interiors of these classic automobiles. Automotive International differentiated itself not only by emphasizing strong client focus but also by being able to rebuild existing parts or find the rare parts across the globe. They had a mission for their shop: maintain the mechanical purity and classic artistic styling of vintage cars; exceed the clients’ expectations; and help train the next generation of technicians to continue this philosophy.As the business and team continued to grow over the next decade they remained true to their philosophy while selectively adding more recent exotic and specialty automobiles. These include Lamborghinis, Maserati, some American muscle cars and classic Italian and English cars. In 2013 Peter Nikonovich came in as a partner to help manage the growth and also develop the strategy and business model allowing Automotive International to continue to meet and exceed the expectations of clients. The next step in the journey is moving to our new facility in 2016. We will double the work space and have a new, state of the art paint booth to provided more efficient service to our clients. The team has grown to fourteen people with varying expertise. This allows Automotive International to continue provide full range of services and increase the types and number of cars serviced. Automotive International is dedicated to keeping the classic cars pristine and original as possible, while maintaining the modern exotics in optimum performance condition.